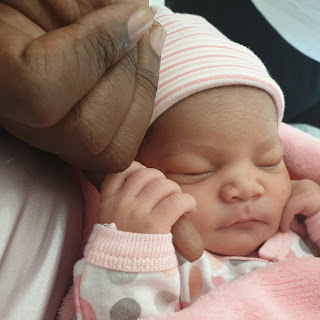 Controversial Harare businessman Wicknell Chivayo, affectionately known as Sir Wicknell by his legion of fans, last Friday welcomed baby number two and this time it is a girl.The business mogul, who is married to Sonja Madzikanda,welcomed his first offspring, a baby boy, John Chenjera, on January 19, last year. Chivayo was on cloud nine last week as he took to social media to announce the arrival of the couple’s r bundle of joy whom they named Atarah Minana. “GOOD MORNING ZIMBABWE . . . Please help me welcome our daughter ATARAH MINANA CHIVAYO to this world . . . Born yesterday on (hallo) FRIDAY (chishanu zuva reropa) 29 MARCH 2019 . . . GOD IS THE GREATEST . . .,” tweeted Chivayo. It could not be ascertained whether his celebration of the birth had anything to do with the day of birth, (Hallo Friday). Friday is generally regarded as a happy day as it signals the end of the working week, marking the beginning of merry-making.It was also on a Friday (March 22) that the businessman was recently acquitted of fraud involving over $5 million by the High Court. Chivayo is also a member of the apostolic sect — Johane Masowe YeChishanu— which respects Fridays as their day of worship. Wilbert Nyahada Nyati: “Congrats Sir Wicknell, haaa murikufamba nebhora mdara. Happy for you”. While some were congratulating him, others were green with envy, to an extent of ‘ “advising” him to go for a DNA test like he did with his first child. Clifford Chandipa, questioned why people were using hate speech instead of congratulating Chivayo and wife. “Why do people have to be negative pa post yemwana nhai?? Ko kungoti Makorokoto,” he said. Last year, Chivayo was forced to conduct the test after people mocked him saying that the baby was not his.